In Fibonacci sequence, each Fibonacci term is a sum of previous two terms. * @problem Sum of even valued fibonacci terms below four million. System.out.println("The sum of even valued terms of fibonacci sequence "
// Default values of first two terms of fibonacci sequence is 1,1. // On adding previous 2 terms we can get next fibonacci term. 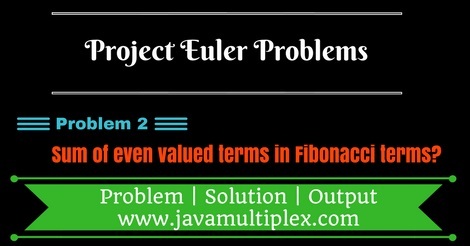 Tags : Project Euler Problem 2 Solution, Mathematics problems, Fibonacci numbers, Solution in Java, List, ArrayList, if statement, Dynamic programming, While loop.